Whoever gets elected this fall should scrap Workchoices and take the opportunity to develop a truly modern labour code. Economics offers four principles for such a code. First, the law should encourage efficient bargaining – that is, bargaining that “leaves no money on the table”. Per the Coase theorem, this means clear and simple regulations so that labour and management can bargain for maximum efficiency even as they fight over distribution. A few basic rules regarding the property rights to employment and workplace decisions in place of rules that are hundreds of pages of micro-managed dos and don’t dos. Second, economics suggests keeping government officials out of the workplace bargaining. Hayek may have been a curmudgeonly conservative terrified by a now obsolete socialist threat, but he was right about lodging decisions with the people who have local information (subject to some concern about externalities). We want workers, unions, and management to have the scope to experiment with alternative contract provisions. We would encourage diversity on the notion that “one shoe does not fit all feet.” If your firm wants to include a clause in a contract that provides a remedy for harsh, unjust, or unreasonable dismissal of workers, you should have the right to do so. Third, we would strive that the parties covered by the code agree on the rules rather than seek to impose them without major public support. If there is one lesson from human resource management, it is that workers participation in decisions -- their voice at workplaces -- is critical for a healthy and productive workplace. The Workchoices legislation is based on an outmoded control-and-command view of how workplaces operate. It is alien to the world in which firms operate on the basis of partnerships, group incentives, team production, profit-sharing, and employee-share ownership. Fourth, economics suggests that any labour code build in some insurance for the protection of workers, even though such insurance may cost a bit of economic output. How much insurance to give workers is a matter of political debate and the weighing of alternative costs and benefits. The more leftwing view can be represented by the following statement: “Perhaps modest economic inefficiency is cost worth paying for if it prevents blatantly unfair behaviour by employers”. The rightwing view is: ”Perhaps some unfair behaviour by some employers is cost worth paying if it gets more jobs”. Different analysts can subscribe to either of these statements and remain true to the economics of weighing benefits and costs. Three of his four points sound to me like a description of the British industrial relations system. We only fall down on the third - employee voice. Yet do economies like Germany, with Works Councils rampant, really have a better performing labour market? Recent months have seen further evidence of union decline in the anglo-saxon countries. Rates of union membership have fallen further in 2006, as trade union recruitment efforts fails to keep pace with a growing workforce. In Canada, union membership levels increased by 62,000 in 2006, while union density fell from 30.0% in 2005 to 29.7% in 2006. "Those in the public sector ...were four times as likely as their private-sector counterparts to belong to a union (71.0% versus 17.5%)", writes StatsCanada. In the United States, the BLS reported in January that 12.0% percent of US employed wage and salary workers were union members in 2006, down from 12.5% a year earlier. "The union membership rate for government workers (36.2 percent) was substantially higher than for private industry workers (7.4 percent)." Less than one in twelve private sector workers are in a union! The latest Australian union membership data, released earlier this month, reported that the proportion of employees who were trade union members slumped from 22.4% in August 2005 to 20.3% in August 2006. By my calculations (see Excel time series), this was the largest percentage point decline since 1999. The rate of union membership (union density) for employees in the UK fell by 0.6 percentage points to 28.4 per cent in 2006, down from 29.0 per cent in 2005. This was the largest annual percentage point decline since 1998. ...but the TUC said the figures in a Trade and Industry Department publication represented a "success story" because membership had almost stabilised since the Thatcher years. Margaret Thatcher left office in 1990, when union density amongst British employees was 37.8% It is now 28.1%, a decline of one-quarter. That's a rather sanguine interpretation of 'stability'. Note: Government statistical estimates on union membership are not available from Statistics New Zealand, although the Industrial Relations Centre at Victoria University do publish annual estimates. John Lewis Partnership is embarking on a highly aggressive expansion strategy which will see the employee-owned business create 35,000 new jobs and double its turnover to £12bn. ...A 10-year business plan, signed off by the partnership board in recent days, will see the retail concern boost its total workforce to 100,000 by 2017. The plan envisages John Lewis significantly increasing its 26 department stores and 184 Waitrose supermarkets. Most policy-makers view the co-ownership sector in the same way as the royal family: a good thing, slightly anachronistic . . . and a bit wet. But firms where workers not only own a real stake but also play a real role in running the firm - where the co-owners are also co-creators - are not for the soft-hearted. These are not reheated co-operatives: pay differentials tend to be lower than in comparable firms, but there is no expectation that everyone will get a same-sized slice of the pie. One of the sources of higher productivity in these "CoCo" companies is tougher peer policing: it is harder to "pull a sickie" when the co-workers who "welcome" you back will be poorer as a result. Information-sharing and innovation levels look to be higher in CoCo firms. The best study undertaken of relative performance suggests a 19 per cent productivity lift from co-ownership. Applied across the economy, co-ownership would make the UK the most productive nation in the world. In a survey of managers in co-owner firms, 72 per cent reported that staff worked harder than in competitor companies, and 81 per cent that they took on more responsibility. Of course, bottom line is the usual 10-point list of demands, including tax breaks. But it seems to me they have a better case than most industry sectors, if the evidence on productivity, employee commitment and job satisfaction in the report proves robust. How are wages and employment of manufacturing workers affected by trade competition? In particular, how are wages and employment affected by the sourcing strategies of their employing firm and those of their competitors? What is the role of unions in this process? I attempt to answer these questions using unique French data that matches firm-level information on imports, value-added, employment, firm-level data on unions and negotiations, with individual worker data; at a unique moment - the first years of implementation of the Single Market Program (SMP) within the European Community. A simple bargaining model, particularly well-suited to the French institutional setup, allows me to capture the mechanisms by which changes in competition can directly affect wages: changes in the firm's ability to pay (as measured by the quasi-rent, the total pie shared between the workers and the firm) as well as changes in trade competition and sourcing strategies that potentially affect the bargaining process by altering both the firm's and the workers' threat points. I use an IV strategy where export prices of American firms act as instruments for trade competition and outsourcing. First, trade competition affected the size of the quasi-rents, most particularly in large firms where these rents were large. Because workers received in average 20% of the quasi-rent but also because wages declined with competitive pressure induced outsourcing, trade competition has negatively impacted wages. To see how unions potentially entered the process, I re- examine my results when information on firm-level negotiations between firms and unions is added. As expected, in firms with strong unions (those able to impose bargaining on both employment and wages) workers were able to capture a large share of the declining quasi-rent (about 50%). However, the presence of strong unions has apparently led these, mostly large, firms to increase outsourcing with an associated decline in employment. As a result, unions' fight for workers' wages and employment appears to have backfired. SHANGHAI, Oct. 12 — China is planning to adopt a new law that seeks to crack down on sweatshops and protect workers’ rights by giving labor unions real power for the first time since it introduced market forces in the 1980’s. The move, which underscores the government’s growing concern about the widening income gap and threats of social unrest, is setting off a battle with American and other foreign corporations that have lobbied against it by hinting that they may build fewer factories here. The proposed rules are being considered after the Chinese Communist Party endorsed a new doctrine that will put greater emphasis on tackling the severe side effects of the country’s remarkable growth. Whether the foreign corporations will follow through on their warnings is unclear because of the many advantages of being in China — even with restrictions and higher costs that may stem from the new law. It could go into effect as early as next May. It would apply to all companies in China, but its emphasis is on foreign-owned companies and the suppliers to those companies. The conflict with the foreign corporations is significant partly because it comes at a time when labor, energy and land costs are rising in this country, all indications that doing business in China is likely to get much more expensive in the coming years. But it is not clear how effectively such a new labor law would be carried out through this vast land because local officials have tended to ignore directives from the central government or seek ways around them. China’s economy has become one of the most robust in the world since the emphasis on free markets in the 80’s encouraged millions of young workers to labor for low wages at companies that made cheap exports. As a result, foreign investment has poured into China. Some of the world’s big companies have expressed concern that the new rules would revive some aspects of socialism and borrow too heavily from labor laws in union-friendly countries like France and Germany. It has always been tempting to scapegoat "the other" when such economic difficulties come round. But undercutting, exploitation and unemployment are not caused by eastern Europeans, nor are these things a necessary part of a sustainable economic future. And the solution to the growing vulnerability of large sections of people at work that they represent is not to throw up the shutters and put out the "foreigners not wanted here" signs, even if we could. The truth is that the government can do little in practice to restrict Bulgarians and Romanians. They will have a right both to travel here and to be self-employed after accession. EU member states can temporarily restrict employment but, as Germany shows, all that happens is that you replace employees with the self-employed. And their wage levels are likely to be even lower than the super-exploited Polish agency workers who are the stuff of rightwing tabloid scare stories. That is why the TUC conference in Brighton this week will hang up a "you are welcome here" sign. ...We live in an increasingly globalised world. Our best response is not to yield to little England, but recognise that the best way of avoiding a rush to the bottom is to fully embrace Europe; and that means accepting the free movement of labour as well as capital and goods. I applaud your TUC statement on this issue. It is so close to my own view that I thought of simply reading it out and letting it stand as my speech. 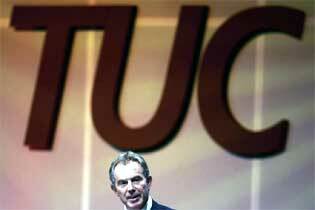 That may be both the first and the last time I can say that of a motion to the TUC. As you say: "If migrant workers are treated fairly and paid a decent wage, they represent no threat to the livelihoods of people who are already living and working in the UK, and... it is good for the people of Eastern Europe because it provides them with growth, better jobs and wages, and spreads and deepens European democratic values. "Creating a common market means that workers must have rights as well as businesses, and there must be freedom of movement for workers as well as for capital, goods and services." In recent years defenders of the European social model—capitalism tempered by a generous and interventionist welfare state—have taken to praising Scandinavia to the skies. ...Sweden, whose 9m people make it by some way the biggest Nordic country, is a particular favourite. A year ago the Guardian, a British newspaper, said it was the most successful society the world had ever known. As if to bear this out, the Swedish economy grew at a sizzling annual rate of 5.6% in the second quarter of 2006, enough to trigger a spate of interest-rate rises by the central bank. Sweden's big companies, such as Ericsson, SKF, Telia and Volvo, are breaking export records. A visit to the capital, Stockholm, confirms that life for most Swedes is pretty good. Yet there is disgruntlement in the air, and it is causing nervousness among the Social Democrats, who have ruled Sweden alone or with other parties for 65 of the past 74 years, and must on September 17th again face the voters in a general election. ...the biggest beef is, perhaps surprisingly, the economy. The opposition maintains that Sweden's economic record is nothing like as good as its fans believe. If so, that has implications for other Nordic economies—and raises doubts about whether other European countries are wise to look northwards for a model. In truth, the Swedish economy's best years are long gone. Between 1870 and 1950, average growth in Swedish GDP and productivity was, by some measures, the fastest in the world. In 1970 Sweden was the fourth-richest member of the OECD club of industrial countries. But for most of the past 50 years the story has been one of relative decline, including a deep recession in the early 1990s (see chart 1). By 1998 Sweden had fallen to 16th in the OECD rankings. It has since climbed back a bit, but the relatively strong growth of the past decade should be seen mainly as a rebound from the 1990s trough. For all that, even the opposition accepts that Sweden has some enviable economic advantages. Anders Borg, Mr Reinfeldt's chief economic adviser, praises the country's well-managed, export-driven, high-tech companies and its well-educated workforce. Female participation in the workforce is higher than in most other countries; English is widely spoken; and Swedes are thoroughly computer-literate. Sweden is one of the few rich European countries for which globalisation has been a benefit, not a threat. Most other European governments would be pleased if they could only emulate Sweden's success. Recent months have seen the science and politics of "happiness" endorsed by commentators of all persuasions. Richard Layard - a consultant to the government - called for a huge increase in the number of publicly funded psychological therapists. These therapists, he suggests, would help to combat the personal and social malaise that seems to be afflicting us at record levels, and their cost will be more than recovered by savings in benefit payments to depressed individuals who will be encouraged to return to work. ...The preoccupation with "happiness" may be convenient for a government keen to appear caring while seeking to avoid social expenditure. In this context, the commandment to "be happy" amounts to a form of insidious social control, in which we are encouraged to look inwards (and to blame ourselves) for the causes of our troubles. Far from being an undesirable trait, the ability to feel and give voice to psychic pain may turn out to be an essential asset: one of the few clear signals that all is not well with our world. We need to develop a greater ability to help people articulate their distress and make this the first step to making their world a more tolerable place. This is a political task: the superficial nostrums of the kind favoured by Layard and New Labour can only be a distraction. These issues are nowhere more sharply revealed than in the world of work. During the past 20 years, coercive control - in the form of stringent targets, performance appraisal, increased monitoring and surveillance in the workplace - has been matched by a culture of long hours and contractual and financial insecurity, even for middle-class professionals. For many, the prospects of falling into chronic debt or poverty are more threatening than ever, especially for the 20% of British citizens who live on or below the poverty line. Second, his contention that cognitive behavioural therapy (CBT) is a waste of time belies a substantial body of evidence that it is quite effective at tackling depression and other common mental health problems. Not to treat serious medical conditions like depression with appropriate and effective care seems irresponsible. Third, how on earth can proposals for a massive expansion in mental health care services be dubbed "seeking to avoid social expenditure"? Richard Layard and others are clearly advocating additional health spending - though they argue it will be pay for itself in the long run. Fourth, Moloney suggests that "coercive control" and long hours in the workplace are a major cause of mental health problems. My reading of the evidence is that neither deskilling/work intensification nor job satisfaction have changed much in the past decade - so how can deskilling be the culprit? The activities that make us happiest, he says, are those where we can identify with our task - which the self-employed can do better than alientated workers - get unambiguous and immediate feedback, and stop worrying about what others think. Activities like playing sport or a musical instrument are great for happiness. Such "flow" came, or comes, from traditional craft work. But it's disappeared from the deskilled workplace. Chris advocates "the abolition of workplace hierarchies". While no one likes bureaucracy, and both greater employee autonomy and team-based working are associated with higher levels of job satisfaction, it seems a tad drastic to abolish management in order to try and improve mental health. Moreover, most businesses based on the 'lean production' model (widespread in the UK) rely on supervision and work monitoring to keep production costs under control and remain competitive. How happy would workers be if we were to send their employer to the wall?